Beautiful certificate from North American Aviation, Inc. issued in 1937. This historic document was printed by E.A. 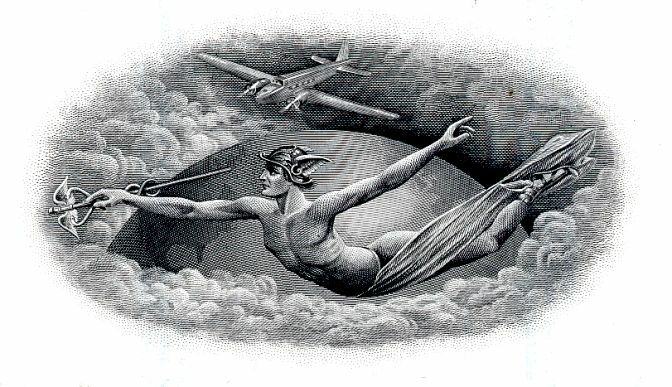 Wright Bank Note Company and has an ornate border around it with a vignette of Mercury soaring above the globe with an airplane in the distance. This item has the printed signatures of the Company�s President and Secretary, and is over 75 years old. During the prosperous, whirling 1920s, aviation was in its childhood. Companies dedicated to airplane manufacturing, engines, propellers, passenger flight and support industries sprouted across the country. On Dec. 6, 1928, North American Aviation was incorporated in Delaware to become a holding company for many of these new ventures. In March 1930, it was listed on the New York Stock Exchange. 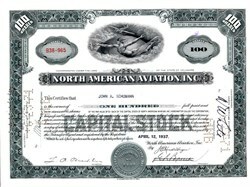 North American Aviation, Inc., had interests in a number of leading airlines and aircraft manufacturing companies including the General Aviation Manufacturing Corporation, located at the Curtis-Caproni plant at Dundalk, Md.